Album Info: Corn Puffs locos & trains around Milwaukee, Sturtevant and beyond. Title: CP 42376 > Ed did shoot --- Ed DIDN'T spray! Title: A view of the ongoing depot project from 6th St. 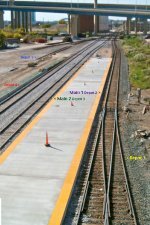 Description: Platform south (left) of depot 4 is complete east of 6th St but the rebar still shows here. Description: Manitowoc crane waits for this one to be brought east. Title: ALL original paint on train 281! Description: That's General Billy Mitchell International airport in the background. 10,000' siding just east of St. Francis Jct. allows PETE to get long trains past each other on the Milwaukee sub.